If you’re looking for the latest strategies in PPC keyword research, there’s something you should know: Google was never designed to be about keywords. Google’s getting closer to that mission, and in 2018 it rebranded AdWords as Google Ads, dropping the “words” entirely. Many older keyword building methods are now outdated or defunct. Today, there’s a new and easier way to handle PPC keywords, and it starts with a focus on users. To understand this new strategy and why it works better, it will help to know what’s different about the current search landscape. 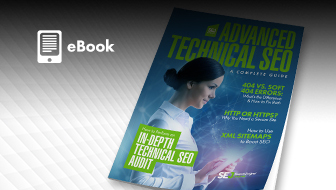 Once upon a time, many algorithm updates ago, Google’s best chance of serving up relevant results was to match a user’s search terms with keywords on a page (or, in the case of paid ads, keywords in a list). A lot has changed. Last week, I did a Google search for a podcast episode. I couldn’t recall the episode number or name. But I remembered the gist of it, and Google knew what I meant. Five years ago, Google wouldn’t have been able to deliver this result, but today Google’s natural language processing and AI have advanced far beyond simple word matching. Google can now understand syntax, entities, sentiment, conversation, and context. Neural matching is being used for 30 percent of search queries. This makes it easier for people to get answers based on what they mean, not what they type or speak. Search for “dentist” and you’ll probably get a list of nearby dental offices. How does Google know to deliver those results (and not articles or definitions) without you even entering your city? Google uses implicit queries (such as your location, search history, behavior, and demographics) to personalize the results you’ll see. Combining your explicit queries (what you type or say) with implicit signals (who you are, where you are and what you’re doing) lets Google tailor the SERP with the most relevant answers, listings, and ads. One of the driving forces behind Google Ads’ auction model is Ad Rank, which is based on factors like a keyword’s ad relevance. But today, many ad formats that appear on Google Search don’t even have the option of bidding on keywords. Campaigns for Dynamic Search Ads (DSA), AdWords Express / Smart Campaigns, Local Service Ads and Shopping Ads are completely keyword-less. They rely on your business type, products, or website to control when ads are served. For more than a decade, Google let advertisers use broad match keywords to catch misspells and relevant variations of queries, while keeping tighter bid control with phrase and exact match types. This option has slowly been retired. Advertisers can no longer opt out of this coverage. Now that exact match is behaving more like broad match, true exact coverage is lost. As the above Google quote implies, to show only for the exact query [deodorant], you’d have to add thousands of negative keywords. With expanded keyword coverage implicit in every match type (like it or not), precise keyword control is no longer an option. Bloated keyword lists just add needless management complexity. The only impression came from my dad (it was part of a Father’s Day present), and he clicked the ad that led to a landing page with his gift. Around the time Google changed its Ad Rank calculation to weigh bids more heavily, it also updated Ad Rank to take into consideration the meaning of the query. If this sounds complicated, think of it like this: Google’s trying to avoid delivering SERP experiences that feel spammy to users by restricting how often (and when) ads can show. Even if advertisers are bidding on keywords, Google is less likely to serve ads if it believes the searcher is looking for information rather than a product or service. Keywords that are unlikely to trigger a click (generating revenue for Google) aren’t worth its processing power. “Just in case” keywords are no longer eligible to serve ads and don’t benefit your account. 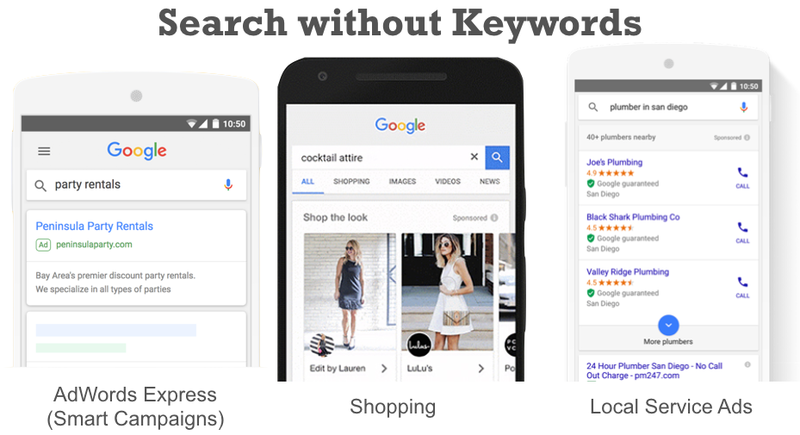 Fewer keywords trigger ads: keywords with low search volume or low commercial intent are DOA. Fewer keywords are needed for coverage: by design, precise keyword control is gone. Keywords are a smaller signal: Google uses search intent and implicit queries in selecting which ads to serve. So how can we take advantage of the new keyword landscape? There’s good news. While keyword research may be getting increasingly complex for SEO, it’s actually easier and faster now for PPC. Here’s a user-first keyword research strategy that will improve your paid search campaigns and save you both time and money. You’re paying a premium to put your offer directly in front of people who are looking for it. What’s the offer your market is ready to say “yes” to (and take out their wallets for)? Once you’ve defined the action your audience takes that drives leads and sales, you’ll identify who’s most ready to take that action. We’re not making decisions about keywords yet, we’re making decisions about our audience and prospects. In Breakthrough Advertising, Eugene Schwartz breaks out prospect awareness into five separate stages. You can typically expect higher conversion rates and better performance from the “most aware” audience, so you’ll want to focus your efforts there first. But you’ll eventually want to branch out – either because there’s not enough search volume for “most aware,” or you want to fill your customer pipeline. Your next step is to start filling in keyword themes that support your audience’s stage of awareness. 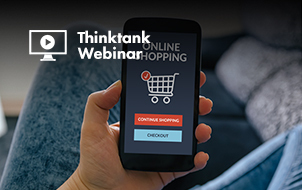 This is not a one-size-fits-all exercise; you’ll bookend your categories based on the search volume, value, and specificity of your own products and services. For example, “freelance copywriter” could be a product-aware term for a marketplace offering freelance copywriting services, but a problem-aware term for a copywriter specializing in long-form sales copy. Consider: If your audience is completely brand loyal or you have no PPC competition, being #1 organically may be enough. But if competitor ads appear above your organic listing, defensive brand bidding can keep you from losing sales and customers. 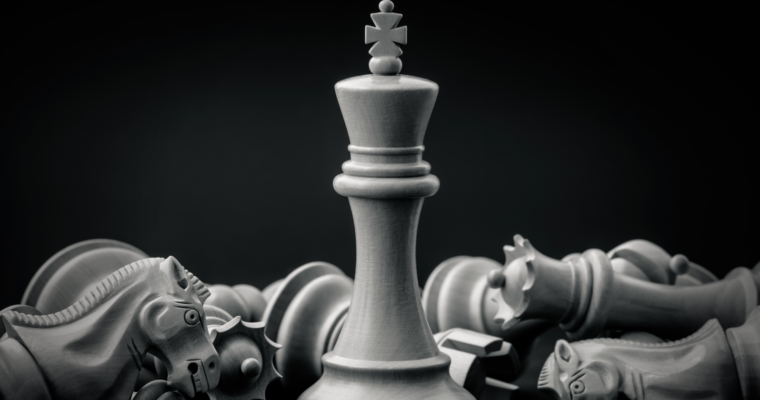 Consider: Competitor bidding can be expensive because your ad is less relevant to the query. It can still be effective, especially if your competitor’s brand has become genericized (i.e., jacuzzi, super shuttle). If the market is looking for products your competitor offers that you don’t, or they aren’t considering an alternative (i.e., Facebook), it makes less sense to bid on those brands. Consider: There’s no hard line between product, solution and problem aware. You’re just grouping intent as it relates to your business. 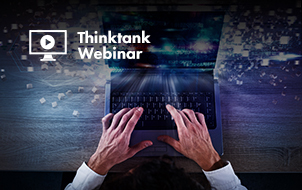 Consider: Problem aware keywords that don’t tie directly to your offer and don’t have “commercial intent” are less likely to trigger ads or drive sales. Stay anchored to your goal. Now that you’ve got a general idea of the keyword themes to target and you know who’s most likely to take action, what’s left to research? But the best research doesn’t come from blindly auto-generating or “stealing” large keyword lists. It comes from listening to your prospects and digging deep into your own offer. Google can solve for a lot of synonyms, but you need to know how your market is thinking about your services. Especially if they are in the problem-aware stage, they may not have the vocabulary to describe your offer the way you do. Zero in on the exact language your audience is using with review mining. You can use review sites (Amazon, Yelp, G2Crowd, etc.) and your own user data (Hotjar, surveys, chats, transcriptions) to add to your keyword list and find new terms for each stage of the funnel. 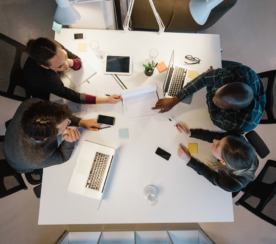 It can be tough to get a clear understanding of the products you’re marketing, especially when the industry is highly specialized. Landing pages can be vague or full of jargon, making it hard to know what problems the product or service solves. Look up the company or product on Wikipedia or a comparison site (like CrunchBase). How do third parties describe the solution? Enter the landing page or site URL into Google’s Keyword Planner. What does Google think the page is about? How can that inform your keyword strategy? Use the SERPs (paid and organic listings) to see how publishers and competitors are describing key points about the offer. 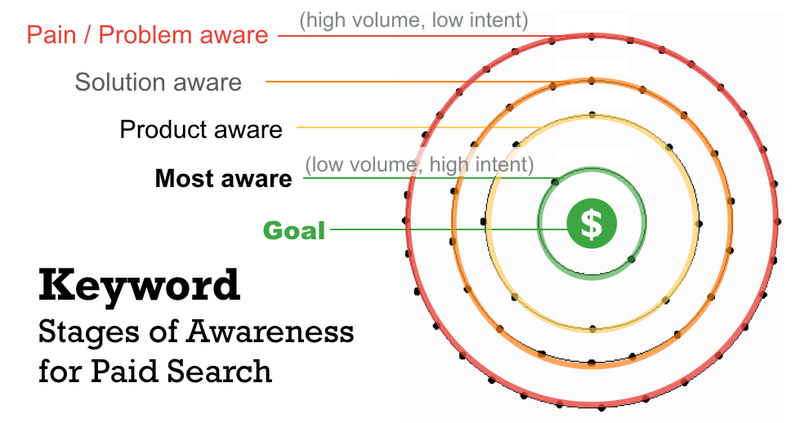 Once you’ve got clarity on your offer and stages of awareness, you can also use keyword research tools to identify and fill in gaps in your coverage. You may have heard that there are keyword modifiers that signal buyer intent (or lack thereof). For instance, terms like “how to open a bank account” or “best running shoes” are informational/consideration terms, while “open a bank account” or “buy running shoes” are decision/transaction terms. The truth is that most of the time, people don’t explicitly state their intent with boilerplate modifiers. Remember our super bowl example above? 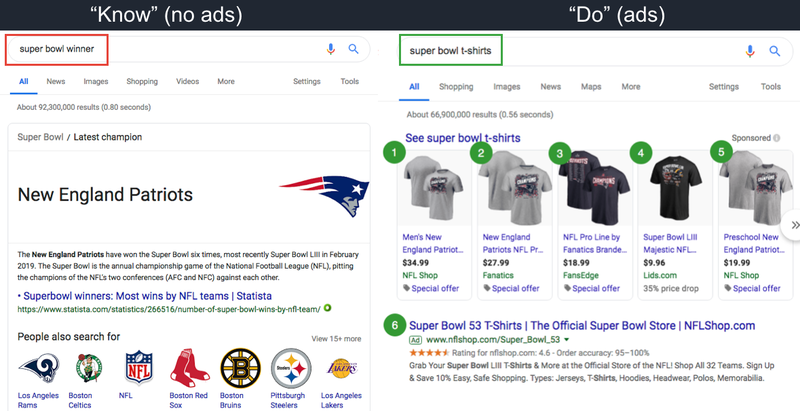 Google used the words “winner” and “t-shirts” (not “learn” and “purchase”) to determine intent. Building keyword lists around standard “intent” modifiers only catches the outliers. 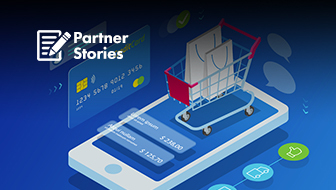 More importantly, the customer journey isn’t so binary. Click the brand’s link from within the article. Start a new search with the name of the luggage brand (product/most aware). Or visit the brand’s site directly. You wouldn’t start your search completely over with “buy luggage” and click an unrelated ad. Doing keyword research this way speeds up your process and helps you reach your audience when they’re most likely to take action. Don’t use plain broad match keywords! Use advanced match types like modified broad match, phrase, or exact match to avoid wasting money on searches that are too irrelevant. Group your keywords in tight themes. 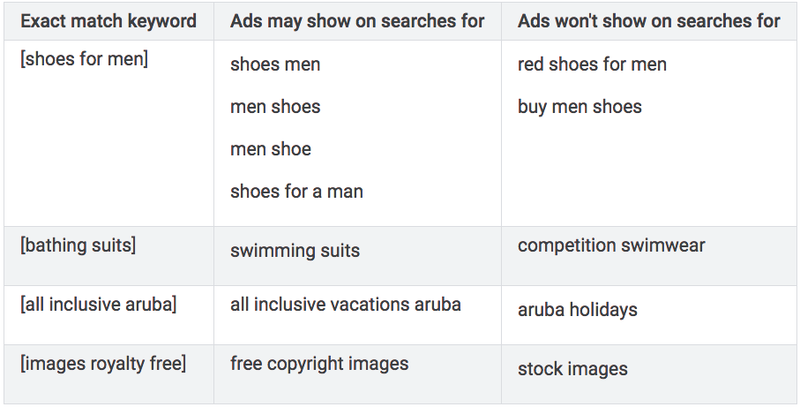 Google can match any ad with any keyword in the same ad group – it doesn’t automatically pick the best match! – so each ad group should be about one primary topic. If you thought PPC keyword research meant you had to find 100,000 keywords to reach your audience: congratulations! You can now let machine learning take over the grunt work of intent and keyword coverage, while you focus on strategy and searchers. Once your keywords are live, the real fun begins. 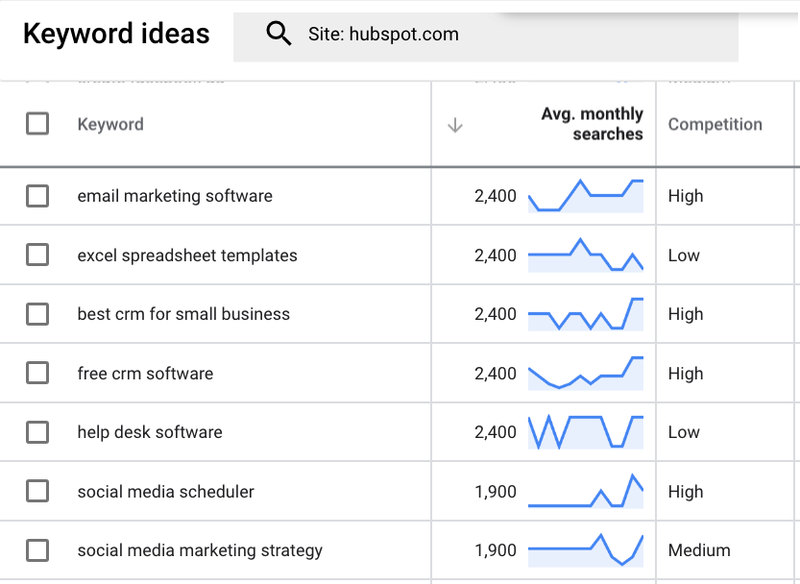 You can use the search term report to see the detailed performance of the actual search terms your audience is using (not just the keywords in your list). 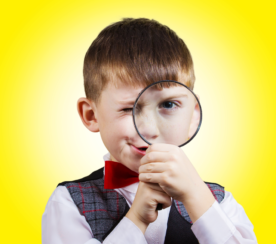 The search term report will help you improve and curate your keyword list. But if you’re starting from scratch with keyword research, it’s unfair to suggest using a resource that doesn’t exist for you yet. Use the steps from this article to build out your audience-focused PPC keyword list today. 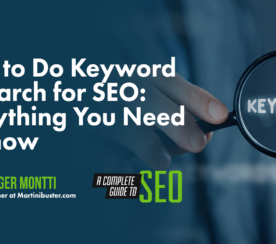 Then be sure to catch the companion article, How to Optimize Your Paid Search Keyword List, in May 2019.